Made from durable 600D Polyester. Massive main compartment partnered with two velcro compartmentalizing walls and clothes tie down. Four external pockets and PALS webbing grid system located on the front. Back and sides provide additional storage to attach MOLLE pouches. Two soft-lined internal pockets,backpack straps that can be tucked away when not in use. 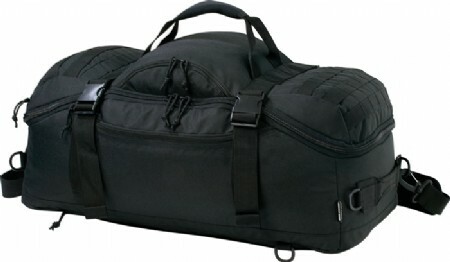 Removable/adjustable padded shoulder strap with multiple positioning and neoprene cushioned handle. Four compression straps to condense down when needed. Pack is hydration compatible when in backpack mode.